CherryTrade FAQ - Speaking with a New SpotOption Broker, Again! 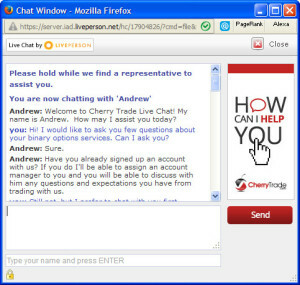 CherryTrade FAQ – Speaking with a New SpotOption Broker, Again! 1. What Makes CherryTrade Different Than Other Brokers? 2. What Binary Options Trading Education CherryTrade Offers For Newbies? 3. Is there any bonus program for new clients on CherryTrade? How big is the bonus wager? 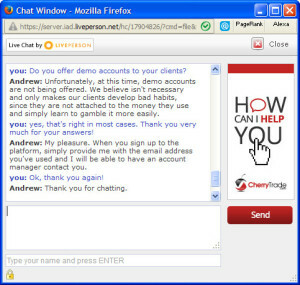 CherryTrade is definitely interesting new broker under the SpotOption brand. That’s why we were interested to make a conversation with their representative. The chat was usual but with quite fast and detailed answers. It was interesting to hear about their semi-automatic trading feature called the iFollow, which lets you copy trades. Although I am not sure how it can be used in practice, it is something to point out. We need more customer reviews and information to access this broker and how genuine it is, but it is for sure we will keep close attention on CherryTrade in the future. Visit the Complete CherryTrade Review by Martin Kay.